412 Barrington Court - Direct Oceanfront Private Villa in Palmetto Dunes! •	3 TVs/ DVD/ Stereo. 37" flat panel in living room and 32" flat panel in master. 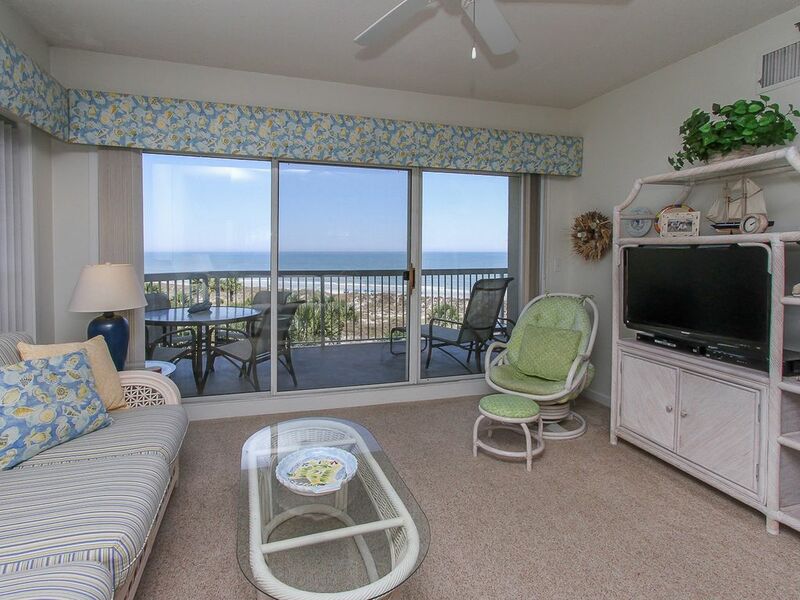 412 Barrington Court is a 2 bedroom, 2 bathroom Hilton Head villa rental. Located on the 4th floor, this nautical themed villa has panoramic ocean views and newly updated baths and kitchen. The open floor plan flows to the dining room with a large glass top table that seats six. The living room is adjacent with a Queen sleeper sofa, love seat, a chair with an ottoman, a 36” flat screen TV and a ceiling fan. The balcony is shared with the master bedroom and offers a direct view of the Atlantic Ocean and has a table with four chairs and a chaise lounge. This is great place to relax and unwind with your favorite book. The fully equipped kitchen has everything you need to make small or large meals. A breakfast bar which seats 2 and has granite countertops separates the kitchen from the living and dining areas. There is also a laundry area with a washer and dryer for guest use. This villa has very good bedroom separation. The king master bedroom is off the living room on the right has a 32” flat screen TV and a sliding door to the shared balcony with an ocean view The private bath features a walk-in shower. There is a single vanity inside this bathroom and one in the bedroom. The guest bedroom is has a tropical flair with two twin beds, a 32” flat screen TV, a private bath with a tub/shower combination. The view from the large window is of the beach and the pool. The view from 412 Barrington Court makes unforgettable vacation. Combine that with the variety of amenities found in Palmetto Dunes and 412 Barrington Court is a great place to stay on your Hilton Head vacation. Our family spent a week here at the end of March 2018. The deciding factor in choosing this property was the huge deck with the amazing view. We were not disappointed! The deck looks right out to the ocean. No pool or buildings to look over or around- just palm trees and sand dunes below you. We considered other units that were a bit more updated, but none of them came close to having this view - with huge glass doors facing the ocean in both the living room and master bedroom. The second bedroom even has a view to the ocean. If I am going to stay near the ocean, I want to see it! From the deck I could even watch my son fish in the ocean. There was a stairway near the unit that allowed you to be on the beach in 3-4 minutes. This area of the beach was not very crowded, which was nice. Everything in this unit was clean and very comfortable. Great, newer shower in the master bathroom. Although we didn't cook much, the kitchen seemed well stocked. There was plenty of room for 2 adults and 2 teenagers. The wifi and tvs were "teenager approved" as well. Lots of walking/biking paths near (as well as biking on the beach). Definitely recommend renting bikes. The property was well maintained, and the pool and hot tub looked nice, but we didn't use them (sadly it was too cold!) Overall, it is a great unit, and we enjoyed it! Please call or send email inquiry for stays longer than one week. Online quotes do NOT calculate correctly for longer term rentals OR for stays that overlap different rate periods. Monthly rentals are four full weeks, Saturday - Saturday.